Happy New Year! I hope you all had a relaxing break and managed to spend some quality time with friends and family (and maybe even some friends of the single malt variety). 2013 looks to be a exciting year in the world of whisky, not just in terms of Scotch (which is always exciting), but world whiskies too. While planning a recent trip to NZ with my wife, I came across The NZ Whisky Company, a company who bottle and sell a variety of NZ single malts and blends under a few different labels. I'd actually tried their DoubleWood 10yo blend at the 2012 "World of Whisky" show in Sydney and found it interesting enough that we decided a visit was in order. Unfortunately there's no longer a distillery, so the visit was limited to the tasting centre (the barrel room was previously open to the public, but has since been closed). Regardless, with a diverse range of blends and single malts, how could we say no? Located on the East Coast of the South Island in Oamaru (a 1.5hr drive from our Dunedin base of a few nights), we made the trip up and my wife kindly agreed to drive back. The town itself is actually very historic and has plenty of sights to see, but this blog post focuses on just the one..
A big sherry nose and a big sherry hit on first tasting. If I'd tasted it blind, I'd have sworn it was a Tassie whisky (which shouldn't have come as a surprise, given I later learned it's a blend of Tassie and NZ whiskies). Not a bad drop, but I'd tasted better. Now this was more like it! Biscuity and light on the palate, with a light but very pleasant finish. A whisky I could happily sip all day. ..even better. Building on the 18yo (they came from the same barrels), the 21yo had a much bigger mouth feel, with cinnamon and just a hint of peat (amplified with a few drops of water). This was my favourite of all the 10 I tried, and the one I took home. Given the impressive 18 and 21yo, I expected a similar profile, but with more character. What I got though was a nose of...fresh laundry? Weird, but that was my first thought. The palate was apples, sweet and fresh. Not what I'd expected. Not bad, but I preferred the 21yo. To me, this had Glenfiddich (both 12 and 15yo) written all over it. Pear, a hint of cinnamon spice, with a bit of peat on the finish. One of my favourites of the day. Similar pear/apple nose, with a taste that seemed younger than its 16 years, in comparison to the other aged whiskies on offer (considering all are aged in the same size barrels). Short finish too. As with the 16yo, but with peat on the palate and a lingering finish. This one had a lot going on, perhaps somewhat contradictory. Sweet, candy apple on the nose. Peaty palate and a long, warming finish. A few drops of water opened it right up and amplified the smoke. Quite different to the 10yo DoubleWood, the nose on this was oranges...very pleasant. The palate was pretty much the DoubleWood 10yo, but with a hint of orange and raisins, and a softening from the 10yo (despite the whisky actually being younger). Not a terribly smooth finish, but all up a solid whisky, certainly worth a try, if for no other reason than the novelty value. Last of all was a complimentary taste of the Milford 20yo. Unfortunately, after so many whiskies my notes for this one just read "tried too many to be objective. Very nice." So after 10 drams and a few interesting stories about the history of NZ whisky, we were on our way. 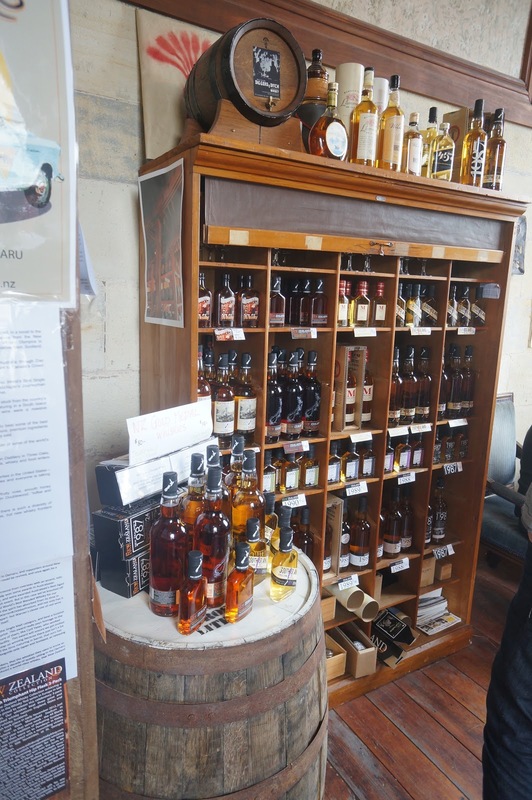 I can highly recommend a visit if you're ever in the area - there aren't too many NZ whiskies, nor too many places you can try such a diverse range of malts and blends from the one company, and it's always interesting to see what the rest of the whisky world has to offer. The staff were fantastic and (despite Sunday being their busiest day) always happy to chat about the Aussie and NZ whisky industries. A very worthwhile visit for some tasty and interesting drams!